Before we dive in, let me set the stage! I have my parents and Nintendo to thank for introducing me to video games, starting with a Christmas gift of an original Game Boy (and a copy of Tetris) in 1991. About a year later, a family friend gave us his Nintendo Entertainment System with copies of Castlevania II: Simon's Quest, Super Mario Bros./Duck Hunt, and Danny Sullivan's Indy Heat...and I was hooked. Since those days, I've been an unabashed Nintendo fan -- from the NES all the way to the Wii U and from that original Game Boy up to the New 3DS XL, I've played on every Nintendo console except the Virtual Boy. But now, for the first time since the Wii's launch in 2006, we have a console that's generated some serious hype. A console/portable hybrid, the Switch has the full backing of Nintendo's now-merged development teams and pretty good indie support. Time will tell if this enough to take the Switch where the Wii U couldn't go, but the software launch schedule for 2017 looks decent. Today though, let's have a look at the hardware, the OS, and some of the different control options/play styles! What do you get for your $299? The tablet is the heart of the Switch. Unlike its predecessor, the Wii U Gamepad, all of the Switch's internals are contained inside this tiny rectangle. iFixIt has a wonderful teardown if you're interested in seeing what's inside. The build quality is excellent, though the tablet itself is thicker than your average iPad or Android tablet. I was really surprise by the weight -- the tablet by itself is about 10.5oz, which is actually lighter than a New 3DS XL (11.6oz)! Even with the Joy Con controllers attached, it's still a very manageable 14oz, just under a pound. The 6.2 inch, 720p screen is capacitive touch (like on your smartphone), a first for Nintendo. The panel is of the IPS (in-plane switching) variety, so the colors are vibrant and the contrast is excellent! Along the top, we've got the power button, dedicated volume controls, a vent (there is a small fan in the Switch, but you can't hear it unless you put your ear right up to the vent), the headset jack, and the Game Card slot. Yep, Nintendo is back to using flash-based game cards with the Switch! Don't, er, try to eat them though. They're covered in denatonium benzoate, the "most bitter chemical compound known to man"...presumably to keep kids from chewing on them? Moving around to the sides and back, we have the metal rails for the Joy Con controllers. They're extremely sturdy, and give the Switch some extra rigidity. Underneath the extremely flimsy kickstand is the MicroSD card slot, which can handle cards up to 2TB...though such cards don't exist yet. Your best bet is to track down a 64GB or 128GB UHS-I certified card -- I'd recommend Samsung's EVO Select or EVO Plus cards. The Switch only has 32GB of built-in storage, so you're going to need a card if you plan on downloading anything off of the eShop. The bottom is pretty uneventful, boasting a single USB-C port. 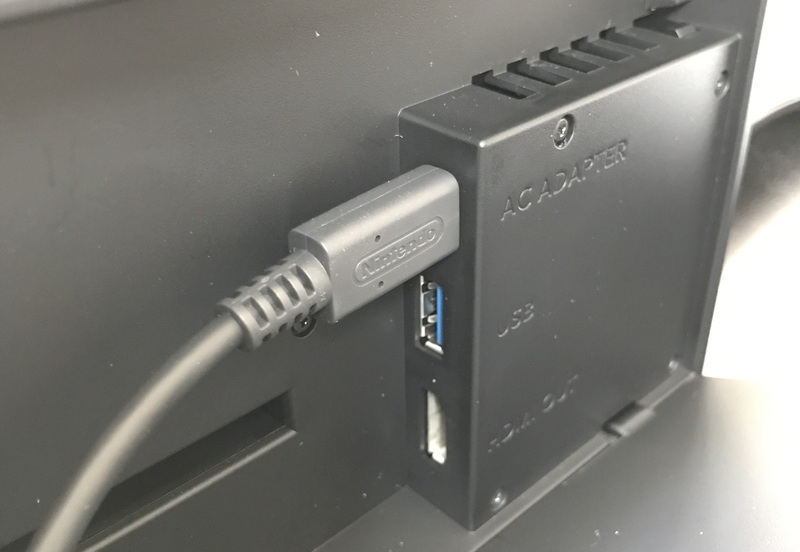 This little port handles just about everything when the Switch is docked, including HDMI video out, charging, and connecting to wired peripherals like the Ethernet adapter. 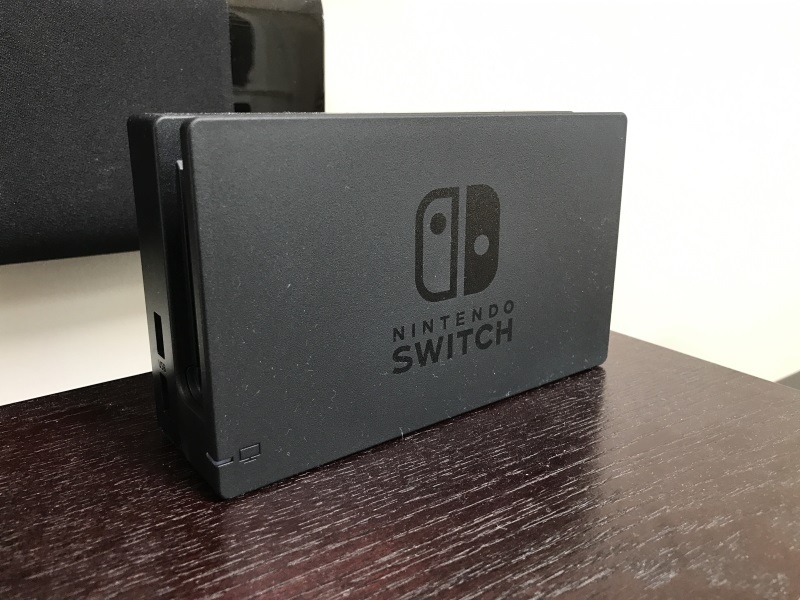 A note on charging -- the Switch is a power-hungry beast. The included charger is capable of putting out 15V at 2.6A, for a grand total of 39 watts. As a comparison, your average phone charger can put out somewhere around 5V at 2.4A, for a grand total of 12 watts. This means that you shouldn't expect your Switch to charge quickly if it's plugged in to a battery bank or a phone charger. So far, battery life is a little on the short side. I've gotten about 3 hours out of my unit when playing The Legend of Zelda: Breath of the Wild undocked. Nintendo says you can get up to 6 hours with less demanding games. These are the Joy Con, the controllers for the Switch! They're small, lightweight, and pretty versatile (as you'll see in a moment). The one on the left has a minus button, two shoulder buttons (L and ZL respectively), four directional buttons, and a dedicated screenshot capture button. 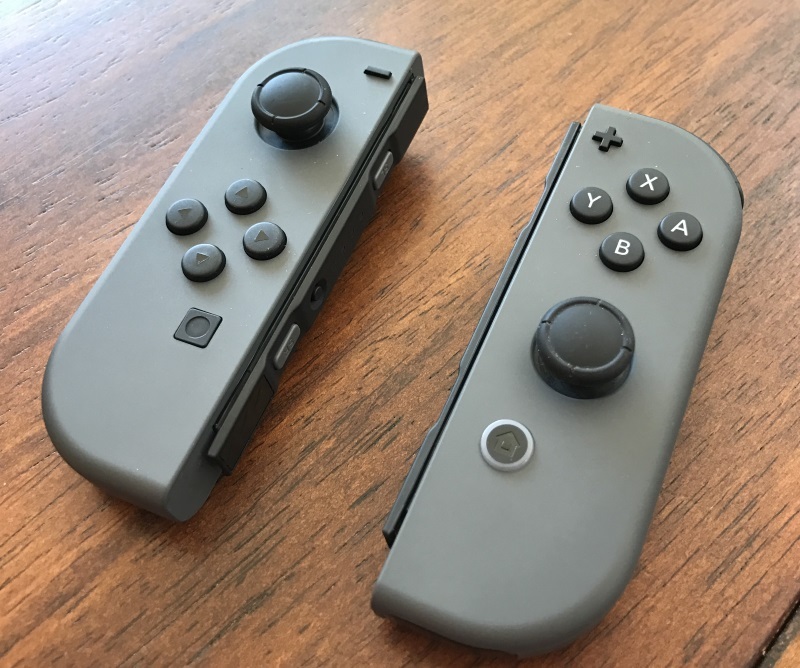 The one on the right has a plus button, two shoulder buttons (R and ZR respectively), the console-standard XABY buttons, another analog stick, and the Home button. It's also got an IR/depth camera on bottom and an NFC chip under the analog stick for reading Amiibo data. Both Joy Con controllers have rumble motors inside too. They charge when attached to the Switch, and Nintendo says each one is good for about 20 hours of use. I'm a bit torn on the Joy Con. They're a little too small for me, so I have to rest them with the bottoms in the middle of my hand. There are a few other compromises that have been made in the controls department: the analog sticks don't have as much range as an Xbox or PlayStation 4 controller. In fact, they're closer to the Circle Pad on the 3DS in terms of how far they can move. I've found that the "split" configuration (in the above photo) feels the most comfortable to me. Your mileage may vary, but I am not a fan of this -- the grips around the back are too small for my hands, and unlike the Xbox-style controllers I use, there's no place for my fingers to rest on the back. I end up with this sort of uncomfortable claw-grip. The other configuration worth mentioning is the "two-player" style. This is used for games where two (or more) people are playing on the same Switch console. 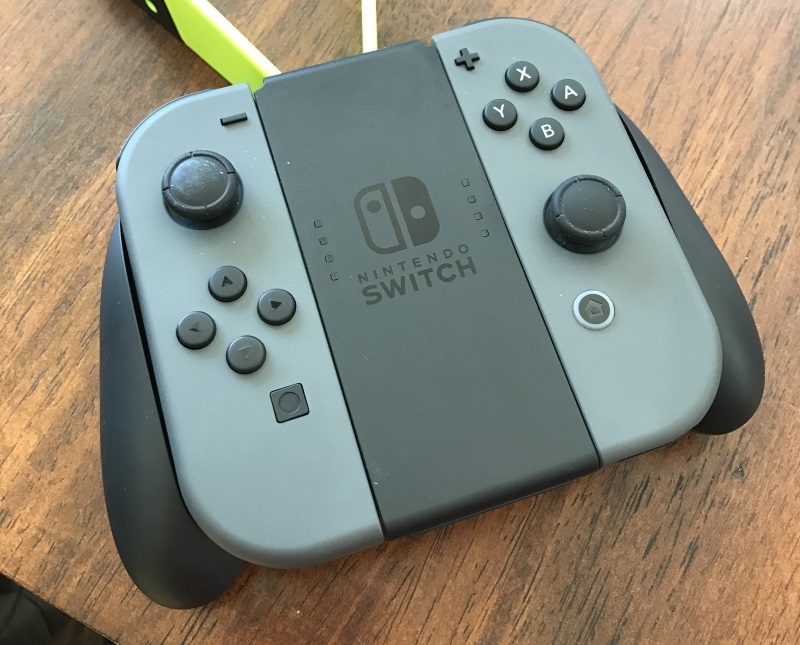 Since the Joy Con controllers are so small, Nintendo has included two wrist straps that make them a bit bigger. The straps also make the shoulder buttons a bit easier to press. 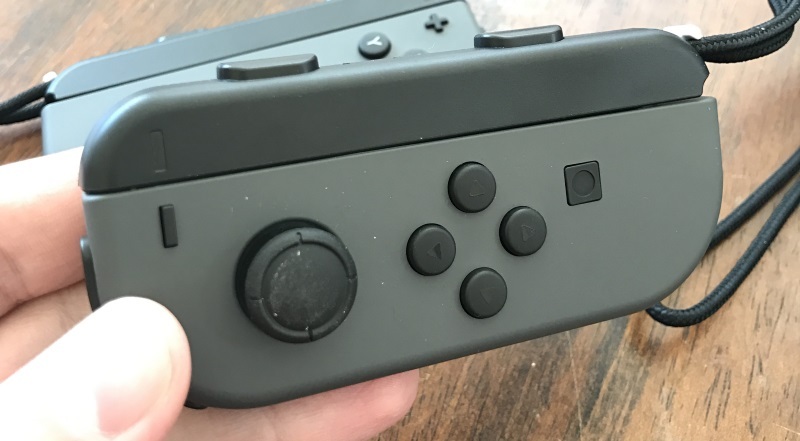 This is okay in short bursts, but the Joy Con controllers are too small to be used horizontally for long sessions. If all of this sounds foreboding, Nintendo also makes a Switch Pro controller, though it's an extra $70 (!) on top of your console purchase. I have one coming in the mail today, so I'll post some impressions after I get some time under my belt! 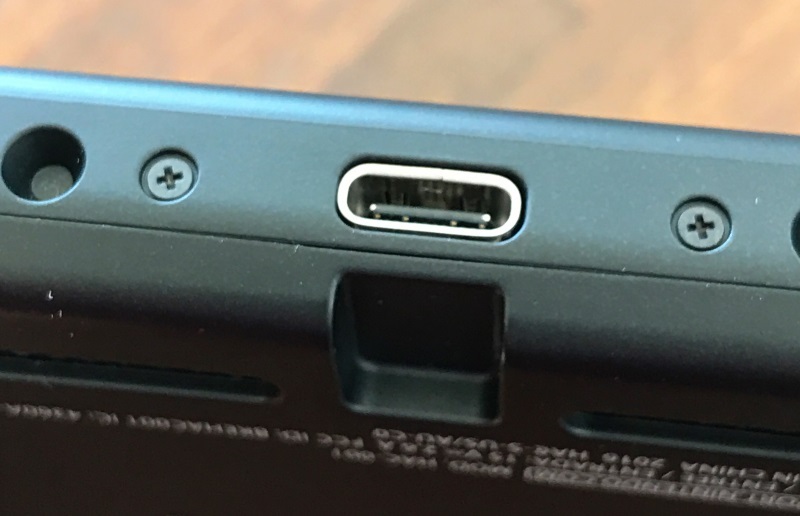 On the left hand side (not shown) are two USB 2.0 ports that can be used for charging things. 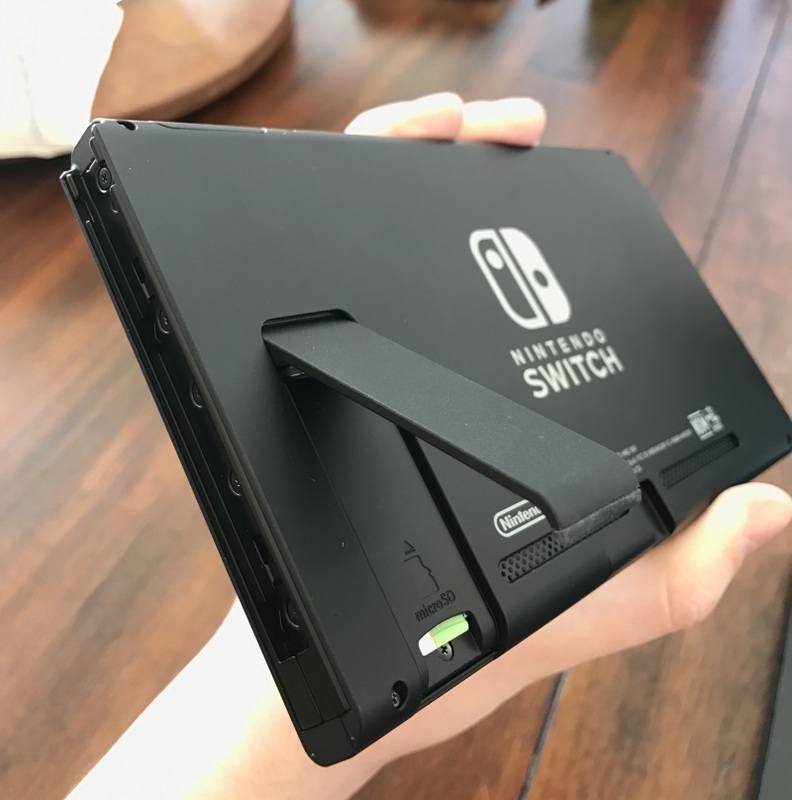 My only concern with the Dock is the lack of padding on the inside-front (where the screen is facing when you slide the Switch in). I'd feel better if there was something soft there to keep the screen from being scratched. I won't spend too much time on the OS, but can say that it's responsive, minimalist, and informative! It's...so, so much better than what was available on the Wii U. Interestingly, it's also one of the few places you can use the touchscreen or a controller to navigate. 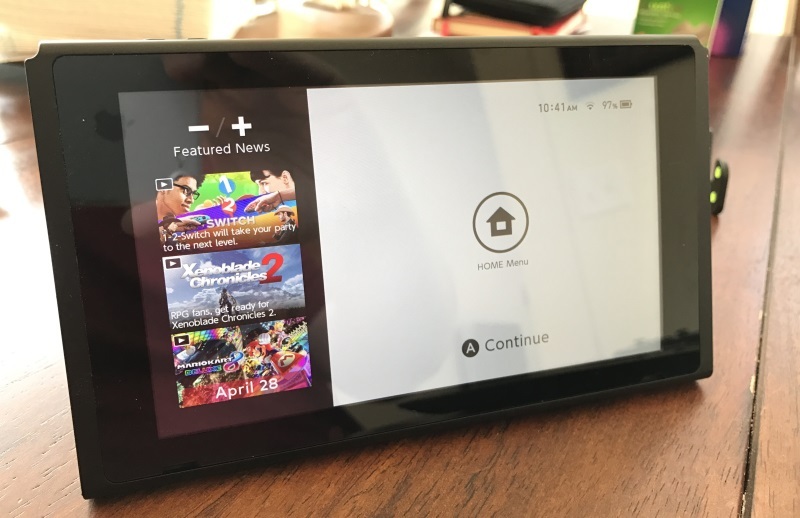 After the v2.0 "day one" update, you'll be able to access the News, eShop, Album, Controller, Brightness, and Power options from the main screen, as well as profile/account settings. A quick note on friends and friend lists; it looks like the all the infrastructure isn't quite there yet. You can add friends via friend code, folks you've recently seen, locally (in person), and through a "Suggested Friends" section that shows friends from Miitomo and Super Mario Run on mobile. There's no way to add folks via their usernames or Nintendo Accounts yet! 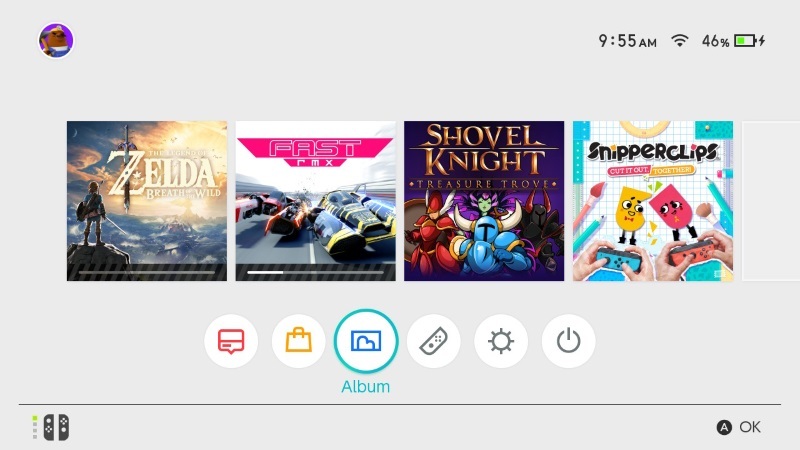 So far, I can say that Zelda, Snipperclips, and Shovel Knight are all good! I'll be doing more in-depth reviews on these titles in a few weeks! I think we're off to a solid start with the Switch, despite some issues with comfort with the Joy Con controllers and an OS whose online features aren't quite finished yet. Nintendo's scattered their big software releases across 2017, and it looks like we'll have beginnings of a healthy indie library on the system as the weeks progress. Did you pick up a Nintendo Switch? How do you feel about it so far? Feel free to leave a comment or post over at our Discourse forum, The Happy Minotaur!